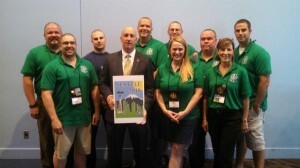 On the final day of business, delegates considered several resolutions affecting fire fighter and public safety, Resolution 11 as amended, which establishes an IAFF policy to protect members in the event of active shooter incidents, as well as Resolution 12, which expresses IAFF support for fire-based community healthcare provider programs. And Resolution 13, which asks IAFF affiliates in Canada and the United States to encourage their employers to adopt the IAFF Hazardous Materials First Responders Operations into their recruit training programs and as a refresher course, also passed. Delegates also adopted Resolution 38, which focused on the inherent danger of aerial operations unique to the work of fire fighters and called on the IAFF to work with apparatus manufacturers, NFPA, NIOSH, OSHA and all other stakeholders to develop equipment and standards that increase safety for the fire service. No such standard currently exists. The resolution was passed. The final resolution of the Convention, Resolution 14, asks the IAFF to review its policies to enable more locals to bid to host IAFF events. Three IAFF affiliates spent the week campaigning to host the IAFF 2018 Convention – Atlantic City, NJ Local 198, Reedy Creek, FL Local 2117 and Seattle, WA Local 27. As the final order of business, delegates voted to hold the Convention in Seattle in 2018, the IAFF’s 100th anniversary year. 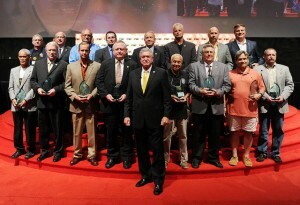 IAFF General President Harold Schaitberger congratulated delegates on their participation in what was an historic Convention. Noting the fallen who were honored Monday morning and whose names adorned the Convention walls during the week, he said, “Tt’s on behalf of these and all those living that we are committed to continuing our journey” before calling for a moment of silence and then declaring the IAFF 52nd Convention adjourned.